The magazine from TROX | TROX Malaysia Sdn Bhd. Our goal is to awaken your interest in air and keep it awake! 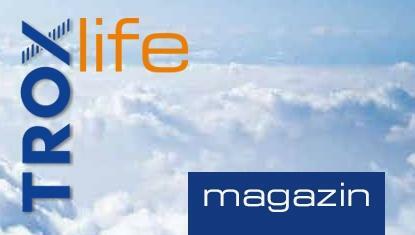 The TROX life customer magazine gives you regular updates on the topic of air and offers many interesting perspectives. Our goal is to awaken your interest in air and keep it awake! The TROX life magazine gives you regular updates on the topic of air and offers many interesting perspectives. Noise and smoke – this is the top topic in our new issue of TROX life. Noise and smoke aren't something you can feel or hold onto – they're just something fleeting. And this is the very reason why controlling the spread of noise and smoke is an art – an art TROX has mastered. The new issue of TROX life centres around controlling the spread of noise and smoke. Reports on two unusual and challenging projects show you just what advanced fire and smoke protection technology can achieve today, and how it contributes to our safety, health and quality of life. Technical details and science are one thing, but we also want to entertain you – with quirky and amusing articles inspired by the theme of noise and smoke. Find out what an onomastician does and accompany us on an excursion into the world of modern myths and legends. ARCHITECTURE AND DESIGN. The art of designing air. The art of designing air.